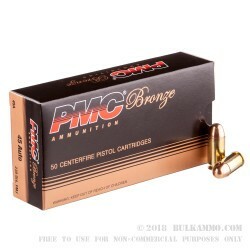 PMC Bronze range ammo is a great way to keep down the notoriously high cost of practicing with a 1911 or other firearm chambered in the .45 ACP cartridge. 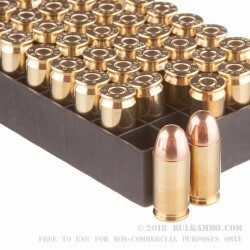 These Boxer primed, brass-cased cartridges fire a 230 grain FMJ bullet at 830 feet per second. Each box holds 50 rounds. 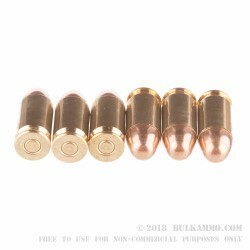 The casings are unfired and reusable, a major plus for reloaders. A popular brand among high-volume shooters for its consistency and reasonable cost, Precision Made Cartridges (PMC) are made in South Korea by the Poongsan Corporation, which makes small arms and artillery ammunition for South Korea’s large military. In business for nearly 50 years, the company keeps costs down and ammo quality consistent through its vertically integrated supply chain and rigorous quality control measures. Cartridges are electronically tested for powder weight in order to ensure loading accuracy. Very good range ammo would recomend this.. I shoot this at the range most every week in my S&W . 45 and my XDs 45. I am surprised that the XDS hits where I aim it at 25 yards. The ammo never misfires and it hits where I aim it. Ya can't ask for more than that. I will say, a 45 going off in the XDS feels like a small explosion. Great gun, great ammo. Im a retired police officer. 26 years on the job. I've shot many an IDPA match with these with no issues. 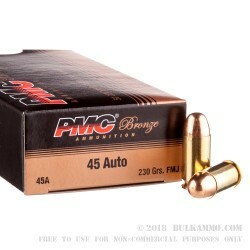 Would buy anytime good reliable ammo. High quality ammo for my Kimber at a great price!